FIG Commission 9 (Valuation and the Management of Real Estate) took compulsory purchase and compensations in land acquisition as the main topic for the period 2007–2010. Compulsory purchase (expropriation, eminent domain) is in most countries an important tool for acquiring land for the purposes of public use, even if land acquisition can often be arranged through other means such as voluntary agreements. Compulsory purchase should ensure that land can be purchased for adequate development opportunities for the wider public benefit, while individual land rights and social sustainability are as fully protected as is possible throughout the process. FIG Commission 9 was concerned about how well contemporary regulations and practices function. Because this topic is not covered by valuation standards, there is a need for guidance from professional bodies such as FIG that can contribute in gathering and disseminating information and also work as a discussion forum to support jurisdictions in developing the capacity needed. Papers on this topic have been presented and discussed at all FIG conferences held over the four-year term of office and also at a special seminar was conducted. In addition, three surveys about most the important elements were undertaken to include FIG member organisations and real estate experts in order to gather a wide breadth of information. This FIG policy statement gives recommendations for guidelines in compulsory purchase and compensation. It lays down the most important factors and makes recommendations for an equitable, efficient and effective process of acquisition and awarding of compensation. The publication should be seen as a tool to support politicians, executive managers, and policy-makers in their efforts to deal with land acquisition and compulsory purchase in a fair and equitable way, based on legal standards, full compensation, and acknowledgement of human rights. The expert group which prepared the document was led by Professor Kauko Viitanen, Chair of FIG Commission 9, and included Dr. Heidi Falkenbach, M.Sc., LLM Katri Nuuja and Ms. Liping Huang. In addition Commission 9 delegates, and especially Chair elect Professor Frances Plimmer, and partici-pants and many experts of real estate property contributed to the document. Also many organisations outside FIG were actively taking part in preparation: United Nations Food and Agriculture Organization (FAO), the World Bank, UN-Habitat, UN-UNEP, Aalto University Real Estate Research Group (REG), and the Government of Finland particularly the Ministry of Agriculture and Forest (MAF) and National Land Survey (NLS). MAF, FAO, NLS, and REG have also supported the project financially. On the behalf of FIG, we would like to thank the members of the expert group and all the specialists and organisations who contributed to this publication for their constructive and helpful work and support. The ownership of real estate property is protected by the constitution in most countries, as well as by declarations of human rights. Because of the nature of the real property the right of ownership can, however, be limited. Thus, society, in various forms of government, has reserved a right to interfere in personal ownership of real estate, when it is necessary for the public good. For ex-ample, if the society needs a land area of a real property for a street, the owner has to convey land for that purpose, if not voluntary then by compulsion. For this interference there are normally strict preconditions in order to protect the functions of the free market and equitable treatment of those whose rights are affected. 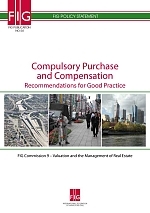 This FIG policy statement presents FIG’s recommendations for good practice in compulsory purchase and compensation in land acquisition and recompense. It aims to support and inform discussion between valuers, surveyors, real estate experts, financiers, urban planners, re-searchers, teachers and decision-makers and develop common principles and the sharing of good practice for shaping the future of compulsory purchase and compensation in land acquisition and compensation. It gives support for professional organisations, including in the area of capacity building and helps to achieve social justice in a resilient balance between economic development, environmental protection, and the livelihood of individuals and local communities. FIG believes that these recommendations are one of tools necessary to help to achieve the UN Millennium Development Goals. use of compulsory purchase has been rather limited and new legislation, practices and methods of valuation for compensation may have developed and been adopted. FIG’s Commission 9 concerns were about how well these new legislations and practices function and also whether the old methods and procedures might have become ineffective or unfair and un-popular. The most critical point concerning compulsory purchase may be the question of compensation. Will the compensation regulations, valuation methods and manners really lead to full and just compensation for those adversely affected? The rules for compensation depend on the legislation of each country. The main principle in most countries seems to be that the landowner’s financial situation shall remain the same despite the compulsory purchase. No one should become poorer because of compulsory purchase but neither should they gain at the expense of the taxpayer. Only economic values can be compensated but non-economic losses cannot. There are no strict rules requiring the owner to be able to purchase a similar property for the level of compensation awarded, although the statutory basis of compensation (which tends to be based on the principle of market value) aims to achieve this, and normally this can even be expected. But if compensation is not adequate to achieve ‘financial equivalence’, there is a major risk that in some cases such an unjust situation will result in a landowner losing the means of making a living It seems that there are also many countries where the rules and / or practices in compulsory purchase are still weak, the know-how limited, and the award of compensation inadequate. The Helsinki seminar provided, a solid starting point for the identification of good practice, and recommendations based on fundamental and profound observations were developed based on the presentations and discussions. Concerning the procedure of compulsory purchase, it can be observed that, from the perspective of the acquiring authorities, there is a need for a speedy timeframe, and low cost process both for taking title and possession of the land and for the fixing and payment of compensation, avoidance of external costs of procedure, and there should be sufficient resources available in advance to pay for the compulsory purchase procedure and the resulting compensation. On the other side, from the perspective of affected occupants, users and owners, there is the need for involvement, transparency and information, avoidance of compulsory purchase (generally – it has to be absolutely necessary), a proper planning and negotiation process and a payment of what is seen to be ‘fair’ compensation. Those issues are also relevant for foreign investors for whose developments the land is being acquired. Further, the interests of women/men, landlords/tenants, formal/informal and indigenous and customary have to be recognised and respected. Resettlement can be an option in certain situations, and if possible should be combined with rights to return. (Viitanen & Kakulu 2008a, 2008b). The major goal of this publication is to support and inform discussion between valuers, surveyors, real estate experts, financiers, urban planners, researchers, teachers and decision makers and develop common principles for shaping the future of compulsory purchase and compensation in land acquisition and compensation. It strives to offer the potential for new and better practices and in that way, contribute to a better and more sustainable living environment for everyone in the world. To be used in developing the national legislation and practices. 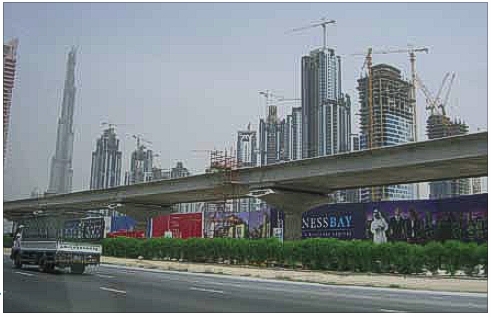 Compulsory purchase and compensations in land acquisition and takings was the main subject of FIG Commission 9 (Valuation and Management of the Real Estate), for the period 2007–2010. The work was organised in the WG 9.1 led by the chair of the Commission, Professor Kauko Viitanen. The subject was progressed in all FIG Working Weeks and conferences by presenting papers and at round table discussions, and in Commission 9 meetings during the four-year work plan. In addition two special seminars were arranged in Helsinki 2007 and in Beijing 2008, and the subject was further addressed at the Verona seminar organised by FIG Commission 7 in 2008. The WG 9.1’s activities made major progress in the seminar on Compulsory Purchase and Compensation in Land Acquisition and Takings held in Helsinki. The seminar was organised in conjunction to the Baltic Valuation Conference and in co-operation with FIG Commissions 7 and 8, FAO’s Land Tenure Service, the World Bank, the Finnish Association for Real Estate Valuation, the Finnish Association of Surveyors, the Ministry of Agriculture and Forest in Finland, the Na-tional Land Survey in Finland, the Nordic Journal of Surveying and Real Estate Research and the Helsinki University of Technology / Department of Surveying. The Helsinki seminar was attended by about 120 very active participants from 35 countries with more than 40 very interesting presentations. Of all papers, 21 papers went through the peer-review process and in addition three were reviewed in the connection of the FAO “Land Reform, Land Settlement and Cooperatives” journal 2008/1. The presentation slides have been published on the seminar website. The full papers have been published mainly in the above mentioned FAO journal themed on “Compulsory Purchase and Compensation”, in the special edition of the “Nordic Journal of Surveying and Real Estate Research” and in the seminar book (Viitanen & Kakulu 2008b) published in the research series of the Department of Surveying at the Helsinki University of Technology. Based on the discussions in seminars and conferences the first draft of the recommendations was structured. Thereafter, a questionnaire aimed at testing whether the recommendations received international acceptance was prepared, and mailed to participants of the Helsinki seminar, FIG commissions 7, 8, and 9 delegates and some other real estate experts in the summer of 2009. The results of the survey were then presented and discussed at the FIG regional conference in Hanoi in October 2009. Based on these discussions, a second draft version was presented at the FIG Congress in Sydney in April 2010 and, after modification, sent for comments in June 2010 to the same group as before. The final draft version was once again sent for comments in September 2010 to those actively taken part in WG 9.1. The aim in the two feedback rounds was to be sure that all important areas have been covered in the guidelines and that the recommendations correspond to a widely-accepted view about principles and good practices. The FIG policy statement and guidelines were then finalised in October 2010. The recommendations are divided in five sections (Figure 1). General principles give overall guidelines to be followed when structuring regulations and activities in land acquisition by compulsion, and should be applied in all phases on the compulsory purchase process. The other four sections discuss in more detail, recommendations related to the separate phases of compulsory purchase process, i.e. compulsory purchase basis, proceeding for the demarcation and registration, the proceedings for the determining compensation, and restitution. A more detailed discussion on the recommendations is provided in Section 3 of this publication. The aim of the discussion section is to help readers to understand more easily the purpose of each recommendation and to provide examples. However, the discussion is not exhaustive and should only be taken as illustrative. Figure 1: The Structure of recommendations. 1 Compulsory purchase shall not be the preferred tool for the acquisition of land. 1.1 Compulsory purchase is not the preferred option if other routes to land acquisition can be pursued, such as voluntary means, land exchange1 or compulsory purchase of partial rights. 1) Also referred to as land-for-land exchange. 1.2 There are circumstances where due to scale of project or complexity of ownership structure, compulsory purchase can, however, be the only feasible option. 2 The compulsory purchase shall be implemented with respect for the rights of affected parties. 2.1 Affected parties and the rights to be taken from them shall be identified in the proceedings. 2.2 Affected land owners, right holders, legitimate occupiers and legitimate users of the land to be acquired as well as persons and different organisations and groups that are affected by the compulsory purchase shall have an opportunity for genuine participation. 2.3 Affected parties, including the poor, women and young people, shall be able to participate effectively in the process and authorities shall provide them the necessary opportunities, advice, assistance, capacity building and knowledge enhancement. 2.4 Affected parties shall have the right to be present, comment, request and be provided with information on issues affecting them, and have their views and comments taken into account before decisions are made. A written statement should explain how such views etc. have been taken into account in the decision(s) made. 3 The compulsory purchase shall be legitimate. 3.1 All aspects of the complete process, in which land is taken, the awarding of powers and the process(es) for acquisition shall be clearly and specifically enshrined in legislation. 3.2 The right to compensation for all losses incurred as a result of the compulsory purchase or depreciation in value of land rights, the method of assessing, agreeing, determining (in the case of non-agreement) and paying compensation to relevant parties shall be clearly and comprehensively laid down in legislation. 3.3 The process for land acquisition and the payment of compensation shall be implemented in accordance with the legislation and internationally recognised best practice. 4 The compulsory purchase process shall be an inherent part of the process of land acquisition and be exercised in an objective, impartial, independent and ethical manner. 4.2 Ex-officio2 principle or other processes, which guarantee that incapable persons (including those absent at the time the acquisition takes place) get a right and fair treatment, shall be applied. 2) Ex officio refers here to the principle where the party responsible of the procedure (e.g. compulsory purchase procedures) is expected to give the affected parties legal protection even if they have not made a request in that effect. In the case of compulsory purchase, an example of the application of this principle requires the body conducting the expropriation procedure to determine the just compensation as part of the due process of law, without the affected party having to request it. Thus, compulsory purchase is not possible without a just compensation to the property right owner who suffers of the compulsory purchase. 4.3 The persons responsible for conducting the compulsory purchase shall have the necessary professional and technical competence and experience as well as adequate resources to undertake the task; the requirements for competence and experience shall be defined in law. 4.4 There shall be a code of ethics (code of conduct) to serve as a guide to the highest professional conduct in the process of compulsory purchase and the assessment of compensation. 5 The compulsory purchase process shall be transparent. 5.1 All documents relevant to the procedure shall be available to affected parties. 5.2 Affected parties shall have the right and a genuine opportunity to access the information. 5.3 Information shall be communicated in a manner which affected parties understand. 6 The costs of the compulsory purchase process are to be carried by the expropriator. 7 The right to appeal to an independent court shall be ensured. 7.1 Affected parties shall have the right to appeal against separate decisions of compulsory purchase, e.g. basis of expropriation, cadastral procedure and compensation. 7.2 Affected parties shall be informed about the appeals procedure(s) available during the different stages of the process. 8 Affected parties have the right to represent themselves and / or use an attorney, expert, or agent to do so. 8.1 The reasonable expenses are to be paid by the expropriator. 9 Compulsory purchase can only be used for public interest. 9.1 Compulsory purchase shall only be used if the benefits to the society exceed the inconvenience and harm caused affected parties who are disadvantaged by the process of land taking and the subsequent development (if any). 10 The basis of compulsory purchase shall be legitimate. 10.1 Principal purposes for which land can be taken shall be clearly identified in legislation. 10.2 The law shall determine who is entitled to use compulsory purchase. 10.3 When the compulsory purchase right is based on a plan (e.g. land use plan), it shall be defined in law how the right to use compulsory purchase is initiated and how the process of land designation can be challenged. 11 The scope of compulsory purchase shall be determined so that it causes the least harm to affected parties while ensuring that the project for which land is taken can be implemented effectively. 12 When the right to use compulsory purchase takes effect, the time limit for starting the proceeding shall be set. 12.1 The compulsory purchase should be implemented without delay. 12.2 The time limit for starting the proceeding shall be established in legislation. 12.3 If this time limit is exceeded, the landowner or the occupants, whose land is identified within the proposed expropriation, have the right to claim for the compulsory purchase proceeding, if it is not claimed by the expropriator. 13 Where the authority intends to acquire only part of an individual’s land, a formal opportunity shall exist that allows or includes the provision for the dispossessed party to inquire whether there is to be a partial or total acquisition of their property. 14 Cadastral procedure related to compulsory purchase and takings shall be defined by law. 15 Demarcation shall be done according to the compulsory purchase permit. 15.1 The need for a terrain survey shall be evaluated. 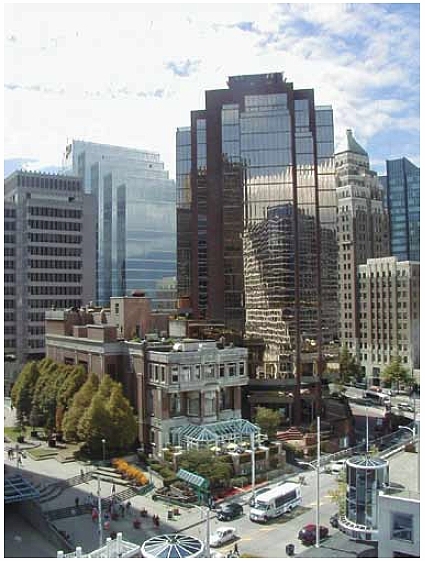 16 Relocation of servitudes, easements etc. rights shall be taken care of within or coordinated in the compulsory purchase process. 17 Boundary and other ownership disputes over legal rights shall be resolved in connection with the process. 17.1 The expropriator shall be responsible for the costs of resolving disputes which stem from compulsory purchase. 17.2 The expropriator shall not be responsible for the costs of resolving disputes which do not stem from compulsory purchase. 18 Registration of the changes in the boundaries of properties and rights shall be entered into the cadastre and land register, or other relevant register and records as recognised and accepted by the authorities and affected communities, on an ex-officio basis, or through other processes. Such processes should guarantee that also incapable persons are appropriately protected. 19 The compensation shall ensure that the affected party’s financial position is not weakened. The term just compensation is, therefore, defined as the level of compensation paid which does not weaken the affected party’s financial position. 19.1 Legislation shall define which losses are compensated and which should be tolerated without compensation. 19.2. Legislation should also determine any preconditions for receipt of compensation e.g. nature of tenure, any occupational requirements. 20 The basis and principle terms of compensation shall be defined by law. – process by which compensation is fixed, agreed, appealed, paid and the rate of and extent to which interest may be paid on any outstanding amount. – compensation for all surveyors and legal costs (also including compensations for those whose land is not expropriated but merely depreciated in value). 23 If a residence or a business is compulsorily purchased, the compensation shall be sufficient for a replacement dwelling or a replacement business establishment which corresponds to compulsorily purchased property in physical conditions as well as economic and location attributes. 24 Compensations shall be determined so that the affected party’s financial status does not suffer a loss because of taxation. 25 If there are losses which are considered unsure or unlikely or cannot be assessed at the time of the proceedings, there shall be a possibility for compensation if these losses actualize in the later stage. 26 It shall be clearly stated in law if the impact from the project or the compulsory purchase is taken into account when assessing the value of the object. 26.1 It shall be made clear whether or not the gains in the value of land arising from the project are deducted from the compensation payable (betterment deduction). 27 In particular in the case where compulsory purchase is for public purpose undertaken by other than a public body, profit-sharing principles shall be determined by law. 28 Compensation for the object shall in the first instance be determined based on market value. 28.1 If market value cannot be determined, the compensation for object shall be based on fair value. 29 The valuation process and the valuations shall be done according to the International Valuation Standards (IVS), or other recognised valuation standards. 30 Inaccuracy of the valuation shall be taken into account when determining compensation so that the expropriator bears the risk for inaccuracy. 31 Compensation shall be directed to those whose economic status is adversely affected by the compulsory purchase. 31.1 The parties who are entitled to compensation shall be specifically identified within legislation and the process of implementing powers of compulsory purchase. 31.2 Customary rights, family rights, women’s rights, societal forms of property rights (tribal/group/individual) and informal possession rights shall be included and recognised within the process of implementing powers of compulsory purchase, as well as the legislation established for the payment of compensation. 31.3 The rights of the legitimate mortgage holders shall be secured. 31.4 Compensation shall be deposited according to the legal structures of the specific country (e.g. escrow account) when the owner is unknown or ownership is in dispute, the lien is threatened, etc. 32 Compensations shall be paid prior to the taking of possession by the authority. 32.1 In the case of pre-possession, compensation of the object, or an advance payment based on the expropriator’s estimated amount of compensation, shall also be paid prior to the pre-possession. 32.3 The part of compensation, which is under dispute as at the date of possession, shall be deposited with the courts and managed in accordance with national legislation. 32.4 It shall be defined in the law whether the possession is possible if the compensation has been appealed, especially in the case of a residence or business. 33 Compensation shall be paid in money. 33.1 If the party who conveys the property agrees, the compensation can be paid in alternative ways, such as land and corporate shares, or through proceedings such as land swap. 34 Compensation shall be paid in a single once and for all payment. 34.1 For components other than compensation for object, annual payments of compensation can be used, if the party who conveys agrees to such regular payments and legislation enables it. 35 Interest shall be paid on outstanding compensation from the valuation date or possession date, depending on which is earlier, till the full payment is made. 36.1 The payment of compensation shall be controlled by the body responsible for the procedure. 36.2 If the compensation is not paid on time, the affected party shall have the right to force payment through the court process or, assuming that the authority has not taken possession and commenced development, to require that the compulsory purchase shall be annulled. 36.3 In such circumstances as are outlined in 36.2, the authority shall be liable to pay the affected party’s costs as well as higher than usual levels of interest on the outstanding amount of compensation. 37 If the purpose of compulsory purchase is cancelled, abandoned or rights are lost through the expiration of a time limit, the obligation for restitution shall be determined in the law. 37.1 The law shall determine the time period within which the obligation is in force, according to the national provisions. 37.2 It shall be defined in the law whether the original landowner shall have the right of first refusal if the compulsorily purchased land is to be sold in the open market. 37.3 If the property has been legally or physically altered in any way (e.g. by the award of planning permission or by the construction of some object, not including the construction of new boundaries, then it shall be specified in law the time period within which the original owner shall have the right of first refusal on such land. 37.4 In all cases, an original owner shall pay open market value for the land, fixed as at the date the property is offered back by the authority. 38 Legislation may provide for other government departments or national authorities to seek to appropriate the land from the original purchasing authority for another use. 38.1 Legislation shall specify if and under what conditions land purchased by one authority for a stated purpose can be appropriated by another authority for a different purpose. 38.2 Where subsequent authorities have appropriated the land from the original authority but the land remains unused for a period of time specified in legislation, then the rights of the original owner, under Recommendation 37, to purchase the land back from either the original or subsequent owner authorities shall be recognised. 1.1 Compulsory purchase is not the preferred option if other routes to land acquisition can be pursued, such as voluntary means, land exchange3 or compulsory purchase of partial rights. 3) Also referred to as land-for-land exchange. The recommendation outlines the principle for selecting the method for land acquisition. As compulsory purchase constitutes an infringement to the rights of the affected party, other, less draconian methods should be used whenever possible. These methods include the attempt to acquire the land through voluntary means, i.e. by agreement for sale with the owner of the property. This should be seen as the preferred means of acquisition. Other alternative methods include land exchange, where the land owner is compensated with land of equal or similar value (not less) in exchange for the land needed for the project. It is also possible, that the compulsory purchase only concerns partial rights, such as usufruct, and the land owner retains the ownership to the property. Another possibility is for the acquiring authority to create and acquire an easement or servitude for the purpose of the project. An example of this approach is in the building of a power line, where usufruct to the area needed for the project is issued to the company realizing the project and the affected party retains ownership of the property. The landowner may continue to use the property e.g. for agriculture or forestry, subject to the right of the company for access onto the land to inspect, maintain, repair etc. their structures. However, there are projects in which this approach is not possible, because the project in question requires an exclusive right of possession to the property. The scope in which the alternative acquisition methods should be considered varies depending on the situation and the project. Recommendation 1.2 states, that in some cases compulsory purchase may be the only feasible option for land acquisition and development. This may occur in cases, where the scope of the project is large and/or the ownership of the area concerned is complex (e.g. there is a high number of absentee owners or ownership is highly fragmented). Thus finding an alternative method to acquire all needed land may in practice be impossible. When considering the method of acquisition, a balance between the fairness, cost efficiency and effectiveness of the process should be made. Attempting to obtain agreements with all landowners may be unreasonably time-consuming (and therefore costly) and risk the success of the project. Nevertheless, in all circumstances, alternate means of land acquisition (i.e. the avoidance of compulsion) are the preferred options and should be considered in every case, as described in Recommendation 1.1. Recommendation 1.2 should be considered as an exception to the main rule. The recommendation requires the recognition of the rights, including human rights, of the affected party in the compulsory purchase process. These include the right and the opportunity to participate effectively in the process. Recommendation 2.1 requires all affected parties and the rights to be taken from them to be identified in the proceedings (see Figure 2). Identification is necessary to ensure, that all affected parties are given the opportunity to participate and receive a fair treatment in the process and that the property rights taken from them as well as claims for compensation are fully taken into account in the implementation of the compulsory purchase decision or permit. Figure 2: Parties in compulsory purchase. 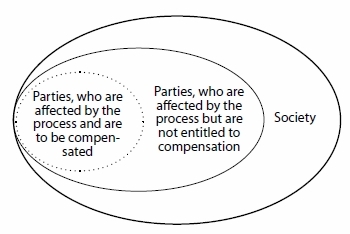 It should be noticed that the borderline between the affected parties entitled to compensation and affected parties not entitled to compensation may be different for the different components of the compensation and that not all effects of the project are compensated as compensation thresholds might be adapted. The requirement of identification applies to parties, whose identity is known or can be reasonably obtained. Attempts should be made to trace and contact absentee owners. It should be noted that the compensation shall be guaranteed and assessed for all affected parties who have right to it, even though they might not have been contacted (see Recommendation 4.2). Recommendations 2.2 and 2.3 list examples of groups of persons, who should be considered as affected parties in the process and given the right to participate and have their views taken into account in the process. A requirement for effective participation is that sufficient information about the process is given to all affected parties equally (see Recommendation 5). Participation also means that all affected parties have the right to be present, represented at, and to be heard in the proceedings, to make statements as well as requests on issues affecting them before decisions are made. All such comments, statements, views and requests should be taken into account in the making of decisions. Recommendation 3 outlines the application of the fundamental principle of legality in both the right to use compulsion to acquire land, in the compulsory purchase process, and in the determination and payment of compensation. Considering the nature and the degree of infringement which compulsory purchase powers causes to the affected party’s rights, the right to take land using compulsion, the process adopted, the base(s) of expropriation, rules concerning fixing and payment of compensation as well as all other relevant issues concerning compulsory purchase and compensation should be clearly and comprehensively authorized in legislation. It is also imperative that the legal process is implemented by all practioners. This is also necessary to ensure equal treatment of affected parties in all cases of compulsory purchase as well as the comprehension, equity and predictability of the application of the procedure. The predictability of the process as well as the ability to ensure the implementation of projects that meet the agreed requirements is also important from the point of view of the expropriator as well as society in general. 4.2 Ex-officio4 principle or other processes, which guarantee that incapable persons (including those absent at the time the acquisition takes place) get a right and fair treatment, shall be applied. 4) Ex officio refers here to the principle where the party responsible of the procedure (e.g. compulsory purchase procedures) is expected to give the affected parties legal protection even if they have not made a request in that effect. In the case of compulsory purchase, an example of the application of this principle requires the body conducting the expropriation procedure to determine the just compensation as part of the due process of law, without the affected party having to request it. Thus, compulsory purchase is not possible without a just compensation to the property right owner who suffers of the compulsory purchase. This recommendation lays out general requirements concerning the impartiality and independency of the compulsory purchase process as well as qualification requirements and ethical guidelines to the body conducting the process. Firstly, the body conducting the compulsory purchase procedure should be an independent and impartial body, i.e. it should have no affiliation to either the expropriator or any of the affected parties that may cause doubt of the impartiality of the body. The body conducting the compulsory purchase process should work exclusively within the legislation and internationally-recognized best practice. Such an organisation should be subject to public scrutiny and to wider democratic and professional accountability for its performance. Recommendation 4.1 applies to both the decision making body, as well as the body implementing the compulsory purchase. Recommendations 4.3 and 4.4 lay down requirements as to the qualification and professional ethical guidelines of the body and/or the individuals conducting the compulsory purchase process. Firstly, the persons responsible for carrying out the compulsory purchase process and making the necessary decisions in it should have the competence needed (e.g. requirement of a certain level and quality of education as well as technical and professional expertise in specific fields such as land management, real estate valuation, real estate law) as well as previous experience and competence in conducting such processes. The application of this recommendation varies due to differences in national education systems, but it serves as a guideline in evaluating the national professional requirements. Secondly, a code of ethics should act as a guide to the highest professional standards of conducting the compulsory purchase procedure and the assessment of compensation. Many national and international organisations in the field have issued such codes, which apply to the member associations and members of such bodies (e.g. Council of European Geodetic Surveyors [CLGE], Code of Conduct for European Surveyors, signed 11–12 September 2009). It is vitally important that the professional and technical expertise involved in this work is enhanced by the highest code of ethical behavior, given the economic, social and political importance of land rights issues, as well as the often large amounts of compensation involved. Adherence to the highest ethical standards should encourage public trust and confidence in the processes involved, and should thus facilitate a less adversarial, protracted and costly process. The recommendation outlines the requirement that the compulsory purchase process be transparent. This recommendation has a strong link to Recommendation 2, which emphasizes the genuine participation of the affected parties in the process. Transparency and sufficient provision of information about the process is essential to ensure effective participation. Recommendations 5.1 and 5.2 lay out, that all documents relevant to the process should be made available to the affected parties and that they must have the right and the opportunity to access the information. Absentee owners must be taken into account and reasonable measures taken to identify and inform them. Relevant information should be given as early in the different stages of the process as possible. It is especially essential, that all affected parties receive information about the initiation of the process. The information given should also be in a form that can be understood by all the affected parties (Recommendation 5.3). Thus, the authorities should not only ensure that the technical and legal language is translated into easy to understand language, but also that there are opportunities for those involved to have both the process and their rights explained to them, in good time, so that they are able to make informed choices, comments and arguments. This recommendation is emphasized in areas where several languages are used, means of local communication are fragmented or the illiteracy rate is significant. The forms of giving information could normally include publication in local newspapers, as well as letters addressed to those individual land occupiers and owners, and, where such individuals cannot be found, notices fixed to the land itself. Consideration should also be given to setting up mobile centres of information so that individuals can more conveniently access both written and oral information, where appropriate. Recommendation 6 requires that the costs of the compulsory purchase process are to be carried by the expropriator. Affected parties are involuntarily participating in the process and should thus not be responsible for any costs that incur directly from carrying out the proceedings. These include e. g. the costs of the administrative process as well as registration. Recommendation 8 concerns the costs from representation and the use of experts. Thus, these costs are not discussed under Recommendation 6. Recommendation 6 refers to costs that are incurred from the process of expropriation. Howeverr, on any costs incurred from appeals, legislation concerning the responsibility and division of the costs applies (this could be general legislation concerning the court proceedings or special legislation concerning the court proceedings in compulsory purchase cases). Recommendation 7 concerns access to justice and the affected parties’ right to appeal decisions made in the compulsory purchase process and the assessment of compensation to an independent court to ensure their legal protection and that the acquisition process is undertaken in accordance with the legislative provisions. This right should extend to all relevant elements of the process, which include the legal right to take the specified land for the stated purpose(s), the use of compulsion, the non-availability of any alternative means of acquisition (see Recommendation 1 above), the base of expropriation in carrying out the project in question, the cadastral process needed for compulsory purchase as well as issues concerning compensation. d. the level of compensation to be paid. It is not necessary (nor is it advisable) that such rights of objection occur at the same time in the process. A process should also be available to those adversely affected by the compulsory purchase to seek an explanation, advice etc. from the body conducting the compulsory purchase in advance of any recourse to the courts and in accordance with Recommendation 5 above. Such an approach to these authorities shall not constitute an appeal, although such a right may be enshrined in legislation. This is important to ensure that any potential court action is taken in the clear understanding of both the specific situation and the rights involved. It should also ensure that court time is not wasted through misunderstandings, or where agreement can be reached in advance of expensive and time-consuming legal action. The appeals procedure is depending upon the national legal and court system in the country in question. In some countries, there are special land courts dealing with compulsory purchase cases, where in some countries, these cases may be heard in general lower courts. Recommendation 7.2 lays out, that the affected parties should be informed about the possibility of appeal during the process, e.g. the decisions which may be appealed and the basis of appeal, the court or other body that has jurisdiction over the matter as well as the appeal period. Such notifications must be made so that those affected have sufficient time to avail themselves of such opportunities. It may be therefore, that different courts are involved in this process; the court for appealing against the level of compensation awarded may be different from that which deals with procedural irregularities, for example. A right of appeal against the court decision must also be made available, although limitations may be imposed e.g. appeal within a limited time frame, on a point of law. Recommendation 8 concerns the representation of the affected parties, as well as the costs incurred from representation. In order to ensure effective participation in the compulsory purchase process, as outlined in Recommendation 2 and 6, the affected parties should have the opportunity to have expert representation and assistance in the process (e.g. an attorney, surveyor expert or agent). Since the affected parties are involuntarily involved in the compulsory purchase process and cannot be expected to have equal knowledge and expertise to represent themselves in the process, costs of such necessary representation and assistance should be paid by the expropriator (refer Recommendation 6). The obligation of the expropriator to pay such costs should be limited to reasonable costs incurred for necessary expert representation and assistance to ensure effective participation, and should be paid regardless of any entitlement to compensation. However, a reasonable fee is not restricted to the lowest cost basis and the affected party should be able to decide the necessary level of expertise in order to be duly represented and achieve a fair outcome from the process. The use of averages to assess costs and items of disturbance should be only be a consideration and not a benchmark for deciding costs. Each case should be assessed on its own merits. Any costs in excess of these reasonable costs are to be paid by the affected party (refer Recommendation 6). National legislation should include provisions on payment of representation costs. Where it is necessary for an individual to employ expert representation in advance of the implementation of the compulsory acquisition process in order, for example, to protect legal rights or to ensure effective representation at a relevant hearing or inquiry, expropriators may not be required to pay such professional fees. Legislation should specify a point at which the expropriator becomes liable for the costs incurred by those affected by compulsory purchase. Such a date may be the date when the project is approved, or when compulsory acquisition powers are awarded to the expropriator. Consideration may be given by the expropriator in paying costs incurred in advance of this date in order to ensure efficiency, equity and ethical outcomes in the process, as well as to relief hardship. Recommendation 9.1 states that compulsory purchase can only be used for public interest purposes. Public interest can be defined as an outcome (e.g. development) in which the public as a whole has a stake and from which the public as a whole will derive considerable benefit. It refers to actions of a government or an organ or agent of government which provides services or development which is recognised in legislation as being of benefit to the community as a whole. In national legislation public interest may be defined by or can include such terms such as public use, public purpose or benefit to society. Unless there is a specific definition in legislation of the term, public interest is defined by evaluating such things as the nature of the project for which compulsory purchase is used, its intended outcomes, and the source of the costs involved in realizing the project. It is not necessary, that a public body carries out the project, if the project is to serve a public interest (e.g. construction of a major power line carried out by a private company). Using compulsory purchase as the means for land acquisition should be based on a weighing of interests. The benefit to public good may outweigh the losses and infringement caused to the private parties affected, but this may not necessarily be so, if for example the benefits are relatively few and the number of people adversely affected is relatively large. Costs of acquisition, development and compensation, however, may not be a reasonably measure to determine the weighting of interests. Recommendation 9.1 supports the principle of weighing of interests. Recommendation 10 requires the legality of the uses of land for which compulsory purchase may be used. In addition to the general requirement of public interest described in Recommendation 9, legislation should identify clearly the principal purposes for which compulsory purchase is permitted or a mechanism for establishing such purposes as being of “public interest” as well as the bodies who are entitled to use it. Detailed lists of projects or plans are not required, but clear definitions of the above mentioned are vital. If such uses are established in primary legislation, (i.e. are permanently available to relevant authorities), then some additional process which authorizes the taking of (a) particular parcel(s) of land for specific purposes shall also be required. Such a process must allow for objections and appeals against both the taking of the particular parcel(s) of land and the use of compulsion. In cases where the compulsory purchase right is based on a plan, the purpose(s) for which property is to be taken must be shown in the plan decision (e.g. road plan) initiated and authorized by a planning authority, and created using a process of public consultation and objection and appeal in the creation of such a plan. Recommendation 11 lays out the requirement for minimizing harm caused to the affected parties while ensuring that the project, for which compulsory purchase is used, may be implemented. The extent to which compulsory purchase is used as well as the harm caused to the affected parties and the wider community should be kept to a minimum. Harm here refers not only to economic losses, but also other types of harm (e.g. social). The objective should not be minimizing the award of compensation. This recommendation reflects a similar principle to that laid out in Recommendation 1, where other methods of land acquisition are defined as primary in relation to compulsory purchase. This also reflects Recommendation 2 that the compulsory purchase is implemented with respect for the rights, including human rights, of the affected parties. Similarly, when compulsory purchase is necessary for carrying out the project, the most appropriate and least damaging approach from the perspective of the affected parties should be used in order to limit the infringement to their property rights as well as other types of harm. However, the requirement is not to minimize the harm caused at any cost, but to choose the least damaging of the economically and practically feasible options for the implementation of the project. Recommendation 12 sets a requirement for the implementation of the compulsory purchase process. It should be carried out within a reasonable time to limit the harm caused by the process itself to the affected parties’ interest in the property. In U.K., for example, the time frame is set to three years. This recommendation aims to ensure, that the affected parties may require the initiation of the compulsory purchase process within reasonable time. The existence of the right or even potential to use compulsory purchase powers affects the value as well as the opportunities to deal with and use the property (e.g. marketability might decrease, investment may not be beneficial) in question. The affected parties should have the right to obtain a decision, in the expense of the expropriator, about the outcome of the process within a reasonable time from initiation to minimize their losses caused by the prospect of acquisition. However, the request should not normally be made prior to the authorization, by the appropriate authority, of the right, which enables the authority to use compulsory purchase powers to acquire the particular parcel of land. Application should be made to a designated court which has the power to either require the expropriator to proceed with the acquisition or to require the expropriator to declare that the right of compulsory acquisition for the land has been abandoned. In situations where land is identified for use for a public purpose (e.g. with a development plan) and to which it can only be put by a public authority, normally using their powers to acquire land, either by agreement or using their legislative powers, then an owner may find it impossible to dispose of or use the land for any other purpose. If the prospect of the public use of the land (and therefore its acquisition) is likely to take place some years into the future, this may cause hardship for a landowner, who may need to dispose of the land in order in the meantime. Given that it is most unlikely that anyone would pay a market value for a property which has been identified for public purposes within a reasonable period of time, a process should be established whereby an owner can require that authority to purchase the land for what would otherwise be market value (i.e. market value in the absence of the threat of public acquisition and development). If an authority can demonstrate a good reason why such a process should not be implemented (e.g. the authority has no intention of acquiring the land in question) then such a process by the landowner can be defeated. For example, in Denmark, the land owner may require for the purchase of the property after the right to use compulsory purchase has been established for that parcel of land, but before the time limit set for the implementation has expired. The requirement is, that there are special grounds for this related to the personal situation of the land owner. Recommendation 13 sets out the provision that that where an authority proposes to acquire part only of an individual’s holding of land, affected or dispossessed party has the right to inquire that all of their property is to be acquired. Such a decision should be made based on the benefits available to the landowner of using the retained land, specifically on the loss of amenity or material detriment caused to the land retained, under all circumstances. If the use of the retained land is in practice impossible, the authority should have the obligation to acquire all of the property. Recommendation 14 lays out the requirement to define in legislation the cadastral procedure and takings. The implementation of the decision enabling compulsory purchase should be clearly defined in legislation. This includes e.g. the body conducting the procedure, as well as method and process rules to be followed. Recommendation 15 lays out the requirement to follow the compulsory purchase permit in the demarcation. In practice, minor exceptions to the permit may be necessary and it should be defined in the permit, what scope for such exceptions the body conducting the cadastral procedure has. Recommendation 15.1 lays out, that the need for terrain survey shall be evaluated. This is necessary to ensure the proper implementation of the compulsory purchase permit. A terrain survey may be unnecessary e.g. in a case, where a survey has been conducted in connection in a previous process, such as with drafting a plan. An authority should have the right, established in legislation, to enter on to land in advance of acquiring legal rights in order to establish that the land is suitable for the proposed development, and therefore to be satisfied that acquisition is necessary. Landowners should allow authorities access on to land for such purposes, and authorities should be responsible for making good any damage done to the land and/or buildings, and particularly boundary fences etc. in carrying out such activities. 16 Relocation of servitudes, easements etc. rights shall be taken care of within or co-ordinated in the compulsory purchase process. Recommendation 16 requires other cadastral processes necessary in connection with the compulsory purchase process to be carried out as an intrinsic part of the process. These may include relocation of servitudes, easements or other types of rights. Recommendation 17 concerns boundary or other ownership disputes, which may arise between the affected parties in the compulsory purchase process. These disputes should be solved in co-ordination with the main process, to ensure that in the process, affected parties and their rights are clearly identified and an equitable solution agreed. However, the cost for resolving disputes which clearly do not arise from the compulsory purchase procedure should not be borne by the expropriator. Where expropriation involves the removal of or damage to boundary fences, hedges and other physical boundaries, their reinstatement in an appropriate location or their repair shall be the responsibility of the expropriator. Recommendation 18 concerns the registration of the changes resulting from the compulsory purchase proceedings. The registration should be made in the cadastre and land register, or other relevant register, as defined by national legislation and the decisions of the authorities. The recommendation emphasizes the responsibility of the authorities to ensure that the registration is done comprehensively and that the right of absent owners and incapable persons are protected. Recommendation 19 refers to the end result of the compulsory purchase process and the payment of compensation. It requires that the affected party is paid compensation in order to ensure that their financial position is not weakened by the compulsory purchase process. This means that the primary focus in determining the basis and amount of compensation is in the financial status of the affected party both in advance of the compulsory purchase process and after. Recommendation 19.1 concerns the definition of losses, which are not compensated (so called compensation threshold). Compensation may be granted only if the amount of depreciation in property value exceeds a minimum financial threshold. This allows for a de minimis level below which compensation is not payable, and is based on a principle of a social obligation, where certain affected parties may be required to tolerate some restrictions without compensation. In practice this means defining in legislation the descriptions of non-compensatable losses for each base of compensation and consideration regarding the level of harm or nuisance, which should be tolerated without compensation. For example, a project may cause an increase in the level of noise, which however can still be considered normal for the particular environment (e.g. city) and does not cause a significant harmful effect on the value of the property of the affected party. If compensation thresholds are applied, the overall status of the affected party should however be considered (e. g. in cases where several thresholds apply) in order to prevent an unreasonable outcome for the affected party. Recommendation 20 lays out the requirement to define in legislation the basis and principles of compensation. This is necessary to ensure the legal protection of the affected parties as well as the predictability and transparency of the compensation procedure and assessment. The basis and principles of compensation should seek to ensure that the parties’ financial position is not weakened and such a principle should be recognised in the legislation as the overriding outcome to be achieved, regardless of the details specified in the legislation. Recommendation 21 lays out some specific requirements concerning provisions to be made within on compulsory purchase legislation. The law should define, who constitute the affected parties entitled to compensation, the valuation date (the point in time, according to which compensation is assessed) as well as procedural issues concerning the payment. Recommendation 22 requires that the legislation to ensure that just compensation as shown in Recommendation 19 above is paid. Just compensation is based on a definition of losses to be compensated and losses which should be tolerated (see Recommendation 19.1). This definition should be stated clearly within legislation. As Recommendation 22 lays out, legislation should define, which kind of losses or injury the compensation will cover in the compulsory purchase process, as well as the base(s) on which different losses may be determined. These may vary in national legislation. In any event, legislation should ensure that the overall effect of the legal provisions is that the affected party’s financial position is not weakened. In certain cases, it may be financially advantageous for the expropriator to undertake additional works for the benefit of a landowner, in order to reduce the level of compensation payable. Such work may e.g. include the construction of a bridge or an underpass which links two parcels for land which are being divided by the proposed acquisition and development. In such circumstances, and with the agreement of the landowner, an expropriator may undertake such works and compensation payable shall be reduced accordingly to the value of the land with the benefit of such works. The requirement for just compensation for affected parties is laid out in Recommendation 23 (see also Recommendation 22 concerning requirements for legislation). Special emphasis is put on situations where the object of compulsory purchase is the residence or business premises of the affected party. In these cases, the compensation should be sufficient for the purchase of a replacement dwelling or a business establishment corresponding in all material respects to the one compulsorily purchased. In identifying the replacing property, characteristics such as location, physical attributes and, in the case of commercial premises, future profitability should be taken into consideration. This Recommendation aims to maintain the standard of living and the source of livelihood for the affected party. This is especially important in areas, where price levels fluctuate strongly, as well as in situations, where a direct replacement is not possible (there are no substitutes in the market). Recommendation 24 states that the effect of taxation on the affected party’s compensation payment should be taken into account, when determining the effect of the compulsory purchase on their financial status. The application of this Recommendation shall vary due to national legislation on taxation. The aim is tax neutrality, i.e. that regardless of the taxation rules applied, the financial status of the affected party is not weakened. Either the compensation may be free of tax on the basis of tax legislation, or the amount of compensation is to be increased by the amount of tax to be paid. Legislation should ensure that the receipt of compensation does not result in a loss to the affected party through the payment of taxation based on that sum. Requiring tax to be paid on the receipt of compensation defeats the definition of just compensation. Recommendation 25 concerns unsure, unlikely or unpredictable losses or damages. Some losses may be considered unlikely, and therefore, no compensation for them is assessed. Also, some losses may not be capable of determination at the stage of the compulsory purchase process, although the event which gives rise to those losses may be certain. However, if these types of losses occur at a later stage, there should be a possibility for compensation within a reasonable timeframe as given in the legislation. For example, if an owner is required to sell a small portion of garden land for the construction of a highway, then it is clear that, at some time in the future, once the highway has been built and is in use, the noise, smoke, vibration etc. from the use of the highway may further depreciate the value of the property. Such an additional loss may be claimed for at a later stage, when it is clear the extent to which the property’s value has been depreciated if the loss has not been compensated earlier in the process. Recommendation 26 requires a clear statement within the legislation as to whether or not the positive effect on the value of the land affected by the development for which the land is being compulsorily acquired affects the assessment of the compensation to be paid. If there is an increase in value of land retained by the affected person to whom some level of compensation would otherwise be payable, is taken into account, legislation should define to what extent, how and on what grounds such an increase in value can be off set against compensation payable or otherwise denied the owner. As a general rule, and in conformity with Recommendation 19, any decreasing or increasing effect of the plan or project should be disregarded, if, otherwise, compensation paid will weaken the financial position of the affected person and put the affected party in a less advantageous position compared to the neighbouring owners. Recommendation 27 concerns situations, where a private company undertakes the project established to serve public purpose and which requires the use of compulsion to acquire the necessary land. For these cases, profit-sharing principles should be clearly defined in legislation and implemented by the authority or company concerned. A profit-sharing principle means that a compulsory purchase for public purpose undertaken by other than a public body may require an increased level of compensation in order to reflect the profit driven nature of the expropriator. When assessing the compensation, not only the losses to the affected party are taken into account, but in addition to that, also the value of the land to the expropriator (share of the profit). Recommendation 28 lays down market value as the basis for assessing the compensation for the object. This means, that market value is the primary reference for the compensation. Market value refers to open market purchase price of the property as at the valuation date, assuming the highest and best use of the property. Recommendation 28.1 states, that the secondary reference should be fair value, as recognized in International Valuation Standards or other international regulations. This should be used as reference when it is not possible to establish a market value based on transactions of comparable properties, e.g. when there are very few market transactions. It is recognised that compensation based on open market value may not achieve financial equivalence if the value of the improvements of the development proposed or undertaken is removed from the basis of compensation. If the market recognises such added value, then the compensation payable should too, so that the affected party is not to be financially disadvantaged. Recommendation 29 refers to use of valuation standards, which should be followed when assessing the compensation. These include IVS (International Valuation Standards) and other standards. Recommendation 30 lays out the requirement to reflect inaccuracy of the valuation in determining the compensation such a way, that the risk for the inaccuracy is borne by the expropriator. The affected parties should not suffer a loss due to inaccuracy in the valuation. The inaccuracy may be taken into account e.g. by increasing the assessed amount of compensation by a fixed percentage. E.g. in Sweden, the amount of compensation which has been assessed, is increased by 25 % to eliminate the effect of inaccuracy. Recommendation 31 lays out that the compensation shall be directed to the holders of rights that are compulsorily purchased, i.e. those whose economic status is adversely affected. These affected parties and rights should be specified in legislation or at the very least within the process of implementing powers of compulsory purchase. Recommendation 31.2 requires other types of right holders be included and recognised in the process (such as customary rights, women’s rights, societal forms of property rights as well as informal possession rights). Also mortgage holders’ rights should be secured (Recommendation 31.3). Recommendation 31.4 states, that the compensation should be deposited for the benefit of owners, in certain situations. Where appropriate (e.g. where an affected person is absent or where there are competing claims for the rights associated with the land), compensation may be paid into court and administered by the judicial system, until the affected party is in a position to claim the compensation payable. Such compensation should be managed according to the relevant legislation governing the administration of such funds in the absence of the legal owner. Recommendation 32 also concerns the time at which payment should be made of the compensation. As a general rule, the total amount of compensation should be agreed and paid prior to possession. According to Recommendation 32.1, in cases of pre-possession, where the expropriator gains possession of the object before the end of the compulsory purchase procedure, it is recommended that a part of the compensation based on the expropriator’s estimated amount of compensation is paid prior to the pre-possession. Consideration should also be given to legislation allowing early loans against the award of compensation to be made in advance of payment to allow affected parties to re-establish their accommodation requirements. According to recommendation 32.2, in cases where residence or source of livelihood is compulsorily purchased, there should be a reasonable time delay between the payment of compensation and the taking of possession to allow the affected party the time to establish accommodation requirements, physically move from one location to the other and thereby to minimize the disruption to their home and working lives. Recommendation 32.3 states that if compensation is under dispute, it should be deposited and managed for the benefit of the affected party until such time as the dispute is resolved (see also Recommendation 31). Opportunities to make loans against future compensation rights to allow affected parties to protect their own interests and to acquire suitable accommodation at a time and in a manner to suit them should also be contained in legislation. According to Recommendation 32.4, it should be clearly laid out in legislation whether it is possible for the expropriator to gain possession of the object, if the matter of compensation is outstanding or has been appealed, and under what terms. According to Recommendation 33, as a main rule the compensation should be paid in money. Alternative payment methods are however possible, if the affected party agrees (such as land or corporate shares, or through proceedings such as land swap). Where an affected person decides to be paid in alternative ways, then such a request shall be made as soon as possible in the acquisition process and not later than the point at which the affected person informs the authority of the amount of the compensation to be claimed. Any such requests shall be the subject of discussion and agreement between the affected party and the authority and, if the authority is unable to accede to the affected party’s request, monetary payment shall be made. Such requests shall be tested for reasonableness, in the light of the claimant’s circumstances and the authority’s rights and powers to grant such alternative payment methods, including their access to necessary land, shares etc. An appeal against the decision of the authority to accede to the affected party’s request shall be determined by the courts which recognise an authority’s defence of (a) the unreasonably nature of the request in all the circumstances and/or (b) the authority’s inability to provide alternative compensation because of their lack of opportunity or land etc. assets. According to recommendation 34, as a main rule the compensation should be paid in a single once and for all payment. Recommendation 34.1 states, that annual payment may be used, if the affected party accepts and legislation allows this. However, the payment of the compensation for the object should in any case be made as a single payment. Recommendation 35 provides that interest should be paid on the outstanding sum of compensation for the time that has lapsed between the earlier of the value date or the date of possession if that is earlier than the date of payment, and the payment date. 36 The payment of compensations shall be made in due time. Recommendation 36 refers to the payment time of the compensation. Payment should be made in due time and it is recommended, that the body responsible of the procedure controls the payment to ensure a fair process. The recommendation also lays out possibility of court sanctions, if the payment is not made in due time. Should it be necessary for the affected person to seek redress through the courts to receive compensation, then that individual should be entitled to have all costs of the court action paid by the acquiring authority as well as a higher level of interest paid on the outstanding amount from the date compensation should have been paid. Where the decision of the court is to annul the compulsory purchase, and / or the delay on the part of the expropriator has resulted in further losses to the affected party (whether in terms of additional depreciation to the property or other losses), then the expropriator must make full and prompt restitution for all losses, including interest on outstanding payments. The interest and sanctions should be defined in a way that does not allow the expropriator to gain from the delay of the payment. Recommendation 37 concerns situations where the purpose of the compulsory purchase is cancelled or is abandoned and lays down that the obligation for restitution as well as returning of compensation which has been paid) should be determined in the legislation. Legislation should define the time period, while this obligation is in force. It should also be defined in the law, whether the original land owner has the right of first refusal, if the land is on the open market, and if so, for what period of time following the original acquisition. The physical and legal changes made to property during its ownership by the authority may limit by time the right of the original owner for first refusal when the land is offered for sale. Such a provision must be laid down in legislation. Where such land is offered back to the original owner, then, the purchase price should reflect what is then open market value, rather than the level of compensation which was paid originally. Any improvements to the land should be reflected in that sale value. The date of valuation is the date at which the authority offers back the land. 38.2 Where subsequent authorities have appropriated the land from the original authority but the land remains unused for a period of time specified in legislation, then the rights of the original owner, under Recommendation 37 above, to purchase the land back from either the original or subsequent owner authorities shall be recognised. Where land has not been used by the original purchasing authority and another authority has appropriated the land from that purchaser (or a series of such appropriations have been made) but the land remains unused and substantially unimproved, then on the expiration of the time limited mentioned in Recommendation 37 above, the original owner shall be entitled to claim the right of first refusal from the authority which at the time is the owner of the land. Such a right to purchase by the original owner can be defeated by the owner authority demonstrating a genuine, significant and imminent intention to use the land for some public purpose (including a demonstration of the necessary financial means). Where the request to purchase by the original owner is unopposed by the owning authority or the land is offered to that owner, then the price to be paid is the open market value of the land fixed as at the date when the original owner requested to purchase the land or the land is offered back to that original owner. FAO (2008): Land Reform, Land Settlement and Cooperatives 2008/1. ftp://ftp.fao.org/docrep/fao/011/i0470t/i0470t.pdf. FAO (2009): Compulsory Acquisition of Land and Compensation. FAO Land Tenure Studies No 10. Rome. http://www.fao.org/docrep/011/i0506e/i0506e00.htm. FIG (2008): Costa Rica Declaration, Pro-Poor Coastal Zone Management. FIG Publication No 43. http://www.fig.net/pub/figpub/pub43/figpub43.htm. Kalbro, T. (2007): Private Compulsory Acquisition and the Public Interest Requirement. FIG Article of the Month, September 2007. http://www.fig.net/pub/monthly_articles/september_2007/september_2007_kalbro.pdf. Viitanen, K., Vo, D. H., Plimmer, F., Wallace, J. (2008): Hanoi Declaration, Land Acquisition in Emerging Economies. FIG Publication No 51. http://www.fig.net/pub/figpub/pub51/figpub51.htm. Viitanen, K., Kakulu, I. (2008a): Global Concerns in Compulsory Purchase and Compensation Processes, FIG Working Week Stockholm 14–19.6.2008; FIG Article of the month, February 2009 http://www.fig.net/pub/monthly_articles/february_2009/february_2009_viitanen_kakulu.html. Viitanen, K., Kakulu, I. (Eds.) 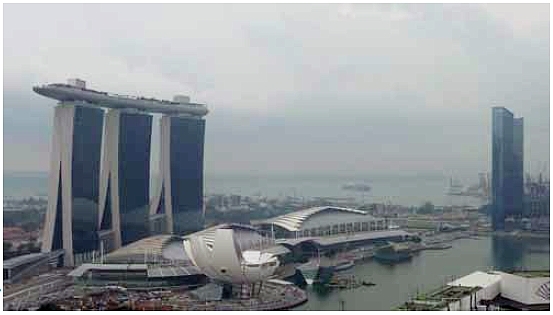 (2008b): Compulsory purchase and compensation in land acquisition and takings. Espoo. Publication B123 in Real Estate Studies and Economic Law, Helsinki University of Technology TKK, Department of Surveying, 195 p.
Viitanen, K., Kakulu, I. (Eds. ), Aarnio, H. (Subed.) (2008) Compulsory Purchase and Compensation in Land Acquisition and Takings. Nordic Journal of Surveying and Real Estate Research, special series, volume 3, 2008. Helsinki. 199 p. ISSN 1459-5885. http://mts.fgi.fi/njsr/. Wallace, J. 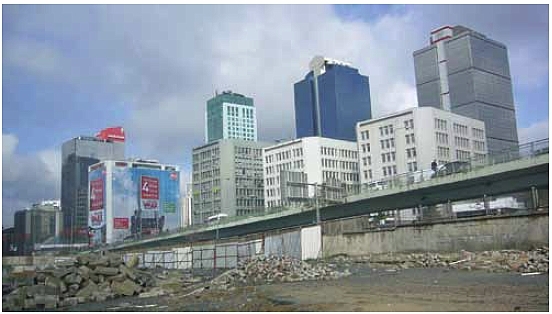 (2009): Land Acquisition in Developing Economies. 7th FIG Regional Conference, 19–22 October 2009, Hanoi, Vietnam; FIG Article of the Month, February 2010. http://www.fig.net/pub/monthly_articles/february_2010/february_2010_wallace.html.